Containers—steel boxes stuffed with goods—and the systems for transferring them between ships, trucks, and trains transformed commercial shipping. Containerization streamlined freight handling and slashed the cost of transporting cargoes of all kinds. It also stimulated big changes for waterfront workers, and for the waterfront itself. In San Francisco, shipowners and longshoremen (who load and unload ships) debated how newly mechanized work would be performed. With fewer men needed to handle containers, longshoremen faced huge job losses. They demanded compensation from the shipping companies. In 1960, the two groups negotiated a labor contract that eased the transition, but forever changed waterfront work. At the same time, San Francisco and Oakland, rivals across the bay, responded differently to the container revolution. With acres of flat land and access to railway and road networks, Oakland embraced the new technology. San Francisco, lacking both, lagged behind and was quickly bypassed as the area’s primary port. By itself, the container would not have launched a revolution in international commerce. Hauling goods in sturdy, standardized boxes had been tried with some success on land and at sea. But the idea of an integrated, mechanized system in which the same container could travel on rail, truck, and ship transformed global trade. The system reduced cargo handling to a minimum. The Newark was built as a C-4 troop transport in 1945. The Sea-Land Corporation converted it to carry containers in 1968. It could carry 272 containers in its hold and on deck. Malcom McLean, a trucking entrepreneur from North Carolina, acquired a steamship company in 1955 with the idea of using its ships to transport cargo-laden truck trailers. McLean’s experiment resulted in the world’s first container ship, the Ideal-X. It made its inaugural voyage from New Jersey to Texas in 1956 with 58 trailers (containers) on its deck. McLean’s enterprise became Sea-Land Services, an international shipping company. This photograph from a Sea-Land brochure illustrated the transfer of a trailer (cargo container) from truck to ship. The Matson Navigation Company, established in 1882, inaugurated containerization on the West Coast. In the 1950s, the company researched ways to control rising costs, and discovered that loading and unloading cargo--moving goods a few feet between ship and pier--accounted for almost half of transportation costs. Aware of container technology, the company decided to invest in it. The Hawaiian Progress begins its maiden voyage, Oakland to Hawaii, 1970. Matson’s first container ship left San Francisco for Honolulu in August 1958 with 20 containers on deck. Within two years, the company’s Hawaiian Citizen, carrying 436 containers in the hold, became the first all-container ship to enter Pacific service. 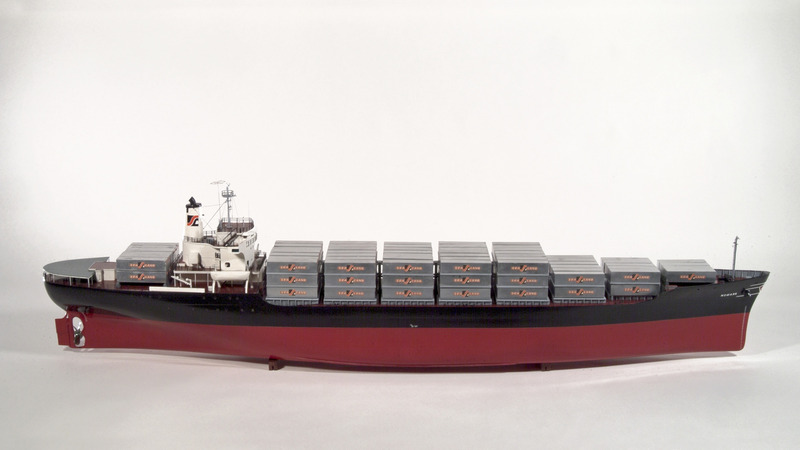 Matson’s first container ships were general cargo vessels converted to carry containers. In 1970, the company launched two ships specially built for container service. At the time they were the largest such ships in existence, each able to carry more than 1,000 containers. How big should a shipping container be? Setting industry standards was crucial to developing a system that would work on ships, trucks, and trains and be interchangeable among shipping companies. Eventually, 20- and 40-foot-long containers became the industry standard. But the Matson Company determined that 24-foot containers best suited their trade between the West Coast and Hawaii. A conventional freighter carries a variety of cargoes packed in boxes, bags, sacks, and other bulk units. This cutaway model of the freighter Lewis F. Luckenbach shows how different kinds of cargo—sacks of coffee, bales of cotton, cartons of merchandise, lumber—fit into the hold. The Lewis F. Luckenbach could carry as much cargo as 700 railroad cars, but it took gangs of longshoremen days to load and unload. Loading a conventional (non-container) freighter usually took several days or longer. Each ship presented a different set of problems since different cargoes required different techniques. Longshoremen, working in gangs, took pride in figuring out how best to pack tons of goods into a ship’s hold, resulting in a “tight stow.” While the work was often hard, dangerous, and dirty, it also required ingenuity, experience, brawn, and teamwork. When unloading a conventional freighter, longshoremen put other skills to work. Some members of the gang loaded cargo into slings. Many operated winches to hoist the cargo. It was a matter of pride not to “let the hook hang”—to work so effectively as a team that there was always a slingload of cargo in motion. Still, unloading often took more than a week. 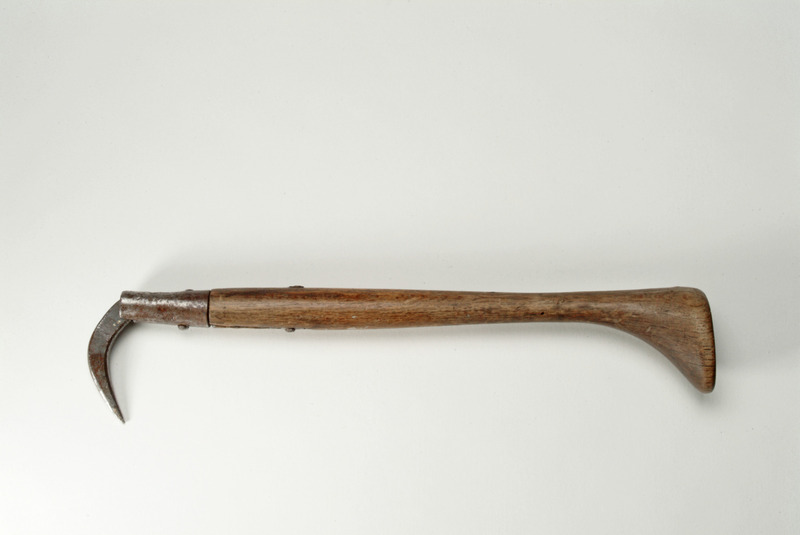 Cargo hooks were the indispensable tools of traditional longshoremen. The hook extended their reach and allowed them to snag a sack, bale, bundle, or box and lift it to a pallet or sling. Longshoremen used different styles of hooks for different kinds of cargo and even customized the handles to fit their hands. 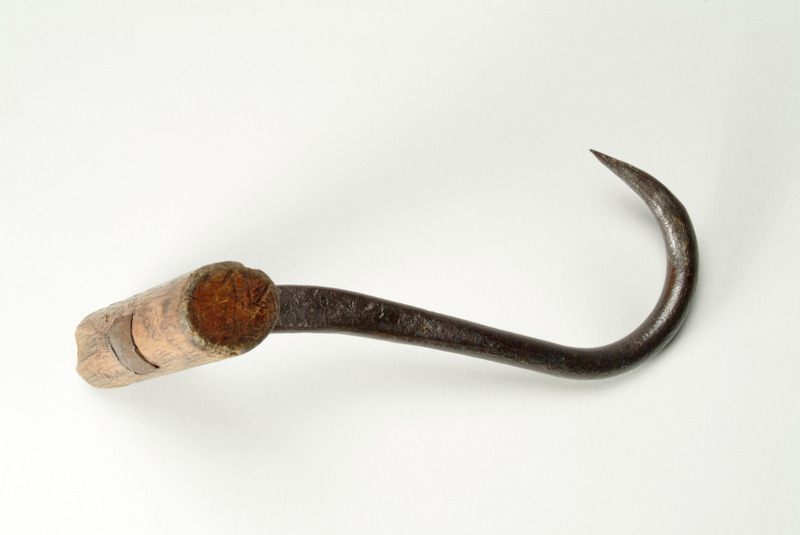 A longshoreman used this style of hook for handling burlap sacks of cargo. The dull tips could grab a sack without tearing it. 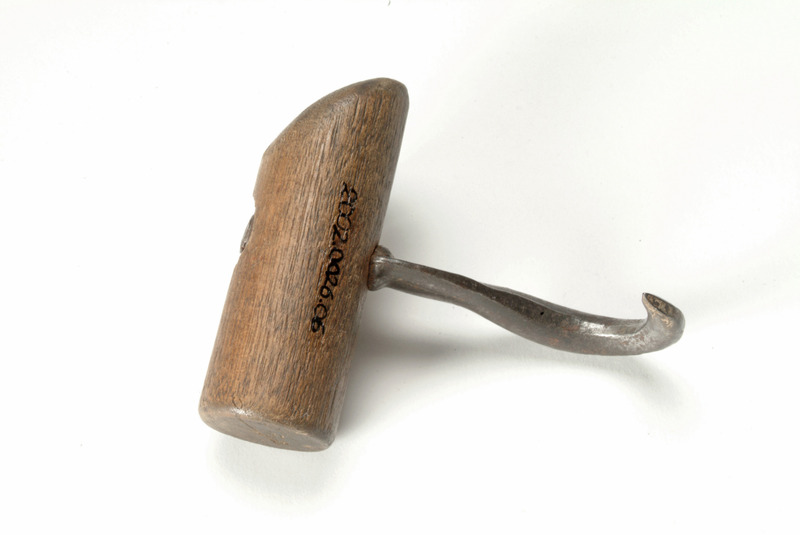 Used for moving sacks of coffee, this small hook’s handle has been whittled to fit the left hand. With the hook extending between the third and fourth fingers, the thumb rests comfortably over the sloping part of the handle. Called a “Japanese” hook by West Coast longshoremen, this style of cargo hook was especially good for reaching boxes packed in the far corners of a ship’s hold. 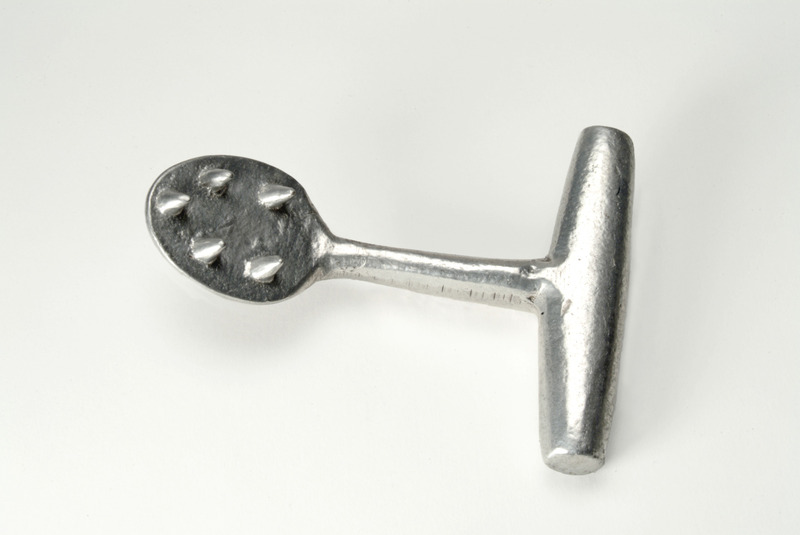 This hook was used for handling general cargo in boxes, cartons, bales, and sacks. “Turnaround time” in the shipping industry is the time between a ship’s arrival in port and its departure. The time it takes to load and unload a ship is often the largest factor in turnaround time. For shipowners, the less time in port the better. A ship in port is not making money; it is generating expenses. In the 1950s, shipowners were desperate for ways to reduce turnaround time. Longshoremen realized that containerization would change their world. 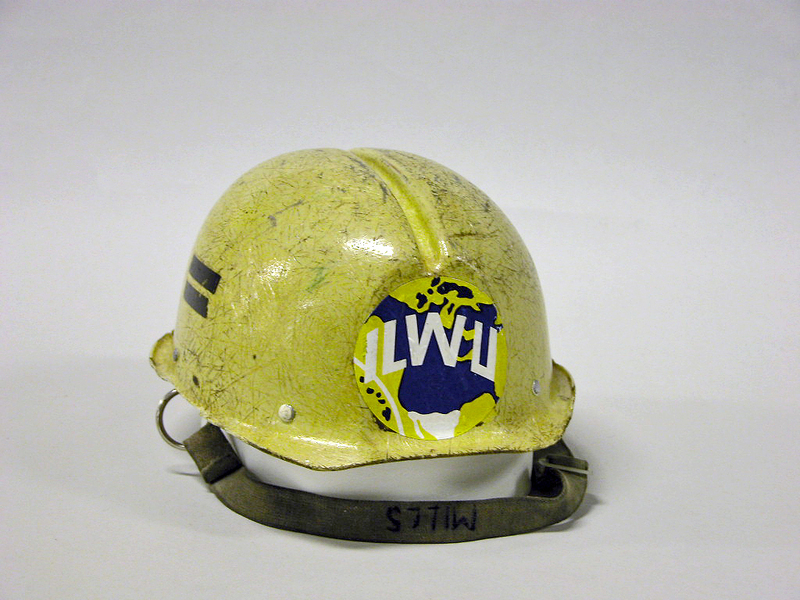 Since 1937, longshore work on the West Coast had been performed by members of the International Longshoremen’s and Warehousemen’s Union (ILWU). By the 1960s, both the union and the shipping companies, represented by the Pacific Maritime Association, recognized that containerization would drastically cut the number of cargo-handling jobs. Would longshoring survive? A charismatic and controversial union leader, Harry Bridges was president of the ILWU from 1937 until 1977. Born in Australia, Bridges became a longshoreman in San Francisco and won the loyalty of maritime workers after leading them through the bloody labor strike of 1934. In the 1960s, the issue of mechanization put Bridges’ leadership to the test, both with shipowners and with his own union members. Cartoons from the ILWU newspaper, The Dispatcher, reflect the anxieties of longshoremen facing the mechanization of their jobs in the 1960s. In 1960, after more than a year of intense negotiations, shipowners and longshoremen’s representatives signed a landmark labor agreement. The Mechanization and Modernization (M&M) Agreement allowed shipping companies to continue introducing laborsaving machines and got rid of old work rules that had become inefficient. It also gave longshoremen a 35-hour workweek and other benefits. And it created a $29 million pension fund, built by contributions from the shipping industry, to encourage longshoremen to retire early. From the strike of ’34 came the hiring hall, replacing the old “shape-up,” where men often had to bribe their way into jobs. 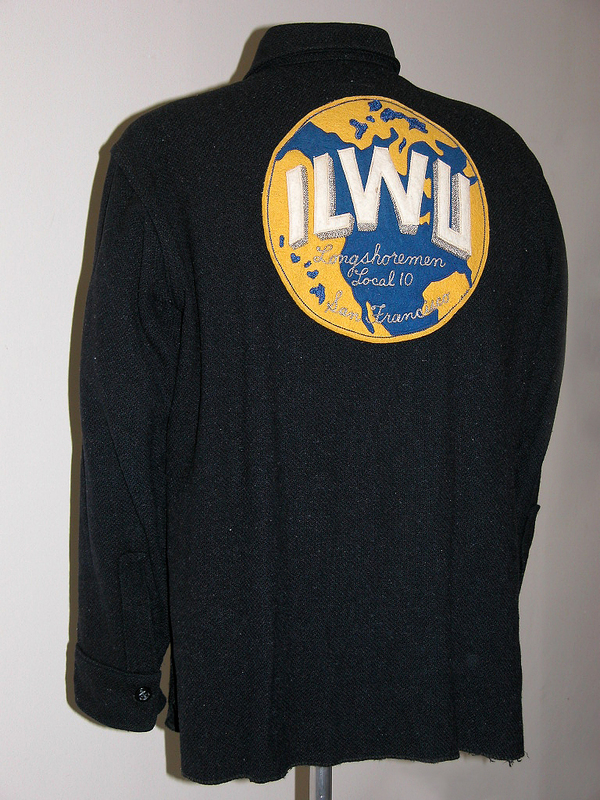 Longshoremen reported to the hall every morning to get work, knowing that the union would assign jobs fairly. Containerization threatened this system. By the mid-1960s, shipping companies were investing heavily in container ships, cranes, and other shoreside facilities. They wanted to select and train the men who would operate the machines, and to employ them regularly as “steady men.” This proposal would create elite workers, effectively blocking jobs from some union members. Many longshoremen were prepared to fight. Containerization brought an end to the working gangs of conventional longshoring. Crane operators work alone in cabs high above the pier. Their job requires superior hand-eye coordination and concentration, for which they are among the highest-paid workers on the docks. 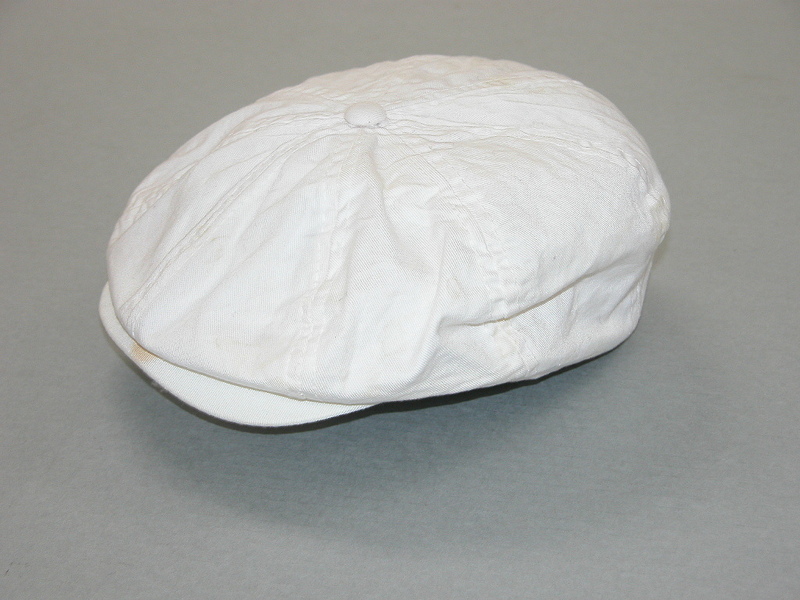 Called the “West Coast Stetson,” this cap was traditionally worn by both longshoremen and sailors. It made men working in the dark holds of ships more visible to operators of deck machinery. Since containerization, the white hat is worn only in parades and for other ceremonial purposes, but it remains a symbol of West Coast maritime labor. 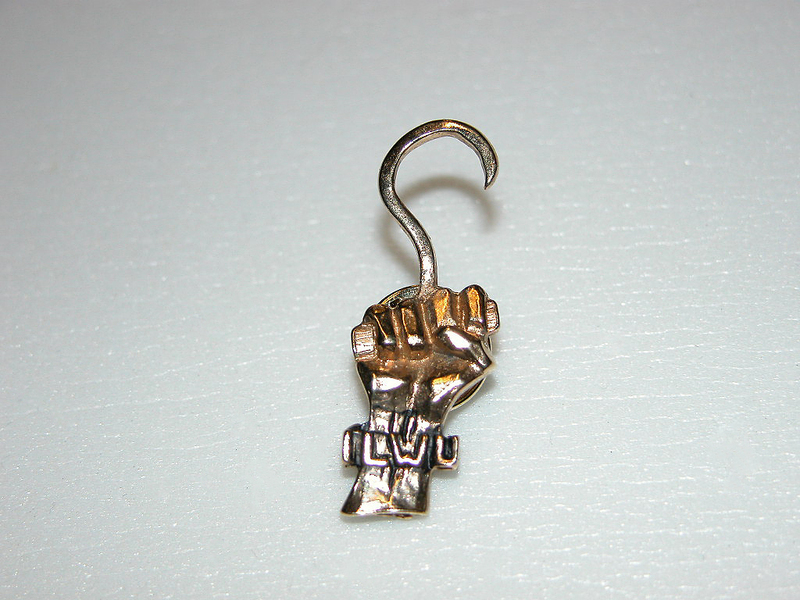 The cargo hook and fist became a symbol of opposition in the 1971 strike. How did ILWU longshoremen fare in the container revolution? Many people believe there were few alternatives and that Harry Bridges got the best deal possible for union members. The pension fund eased the transition into retirement for many, while those who remained received job security, higher wages, and a cleaner, safer working environment. Others believe that the union gave up too much, including its sense of identity. Container operations transformed commercial ports. Suddenly a port needed acres of flat land for storing containers. And direct links with overland transportation were vital. San Francisco’s harbor had served the region well since the gold rush, but its hilly landscape and its distance from major rail systems were disadvantages in the container revolution. Across the bay, Oakland had plenty of flat land for storage, was served by three railroads, and hadtrucking facilities nearby. By 1970, it had eclipsed San Francisco as the region’s leading port. The Southern Pacific Mole, extending into the bay, connected ships with a national rail network. In 1960, the Bay Area Rapid Transit District (BART) began constructing its interurban rail system and built a transbay tube under the mole. BART cleared the mole of buildings, constructed a long dike in the bay, and filled the 140-acre enclosure with excavated material. Oakland’s first new container complex opened on this filled land in 1968. Marine terminals cover more than 600 acres and stretch over four miles of waterfront. Thirty-two container cranes tower over the shore, handling 98 percent of the containerized cargo moving through the Bay Area.